At the beginning of your upkeep, sacrifice two Swamps. 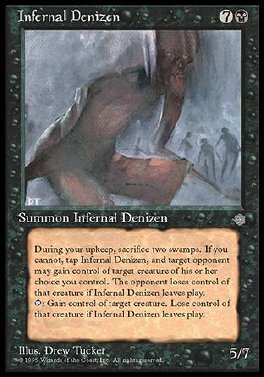 If you can't, tap Infernal Denizen, and an opponent may gain control of the creature you control of his or her choice. That opponent retains control of that creature as long as Infernal Denizen remains in play. T Gain control of target creature as long as Infernal Denizen remains in play.